PC Miracles supplies the know-how to give you an edge in business. Helping businesses in Birmingham, Southfield, Clarkston, Auburn Hills, Madison Heights, Pontiac and the surrounding areas, our competitive network and Managed IT Services help your company get the most for its money. "In the coming year, we see a continued desire for businesses to partner with managed services providers. The managed services industry has always been rather stable through economic fluctuations. The increasing demand would hopefully boost up the industry at a more rapid rate." 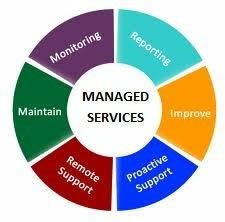 Regardless of your IT needs, PC Miracles can provide the Managed IT Services you need. IT support consulting, wireless networking and overall server management are only a few examples of what we can do for you. We offer the most reliable services possible, and give you peace of mind—along with the opportunity to improve business instead of fretting over IT issues. Relax, we've got your back. IT should be an asset for you, not a worry. Get back to building your company instead of losing sleep over IT problems!